If you are an aid numbers nerd these are happy times. Thanks to a developing norm amongst OECD aid donor countries, increasing amounts of aid data are available for analysis. We’ve taken advantage of this to produce a detailed study of New Zealand aid flows — where New Zealand’s aid goes, what it’s used for, and how it has changed — released this week as a joint NZADDs and Development Policy Centre discussion paper: “Show Me the Money: an analysis of New Zealand ODA expenditure 2002-2011”. You can read the full paper here. For now though here are eight things we think you should know about New Zealand’s Official Development Assistance. 1. The data are getting better. 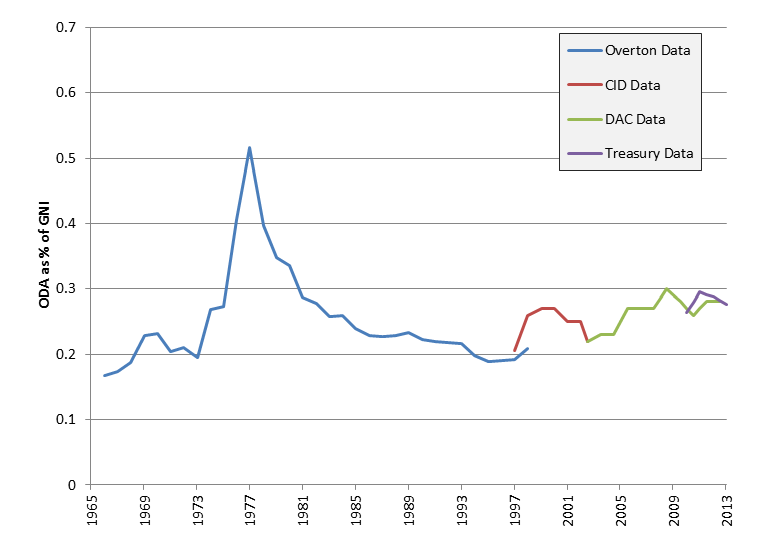 The bulk of the data we used came from the OECD DAC’s database, augmented occasionally from New Zealand Treasury data, and other selected aid reports. All this information was public and (annoying traits of the DAC’s website not withstanding) relatively easy to obtain. Had we time we could have delved even deeper, digging amongst OECD DAC CRS or IATI project level data. This is, of course, exactly how it should be; as New Zealand taxpayers it’s our money, and we’re entitled to know how its spent. Yet governments are not instinctively transparent and ten years ago we would have struggled to undertake as in-depth analysis as we can now. Thanks to the efforts of campaigners and aid agency staff, transparency is on the improve. This is something we are very grateful for. It is also something that means you — if you are from almost any of the OECD DAC donor countries — could replicate our report for your own country. 2. The data are getting better but New Zealand’s aid effort, measured as ODA as a proportion of GNI, is not. Or at least it has not gotten discernibly bigger over the last five years. As a proportion of GNI New Zealand aid is less now than it was in 2008. For chart details for this chart see page 9 of the report. 3. Because of this New Zealand’s aid programme remains small. Small in terms of the sacrifice made: out of every $100 of core New Zealand government spending, less than 80 cents is given as ODA. Based on 2011 figures. For chart details for this chart see page 12 of the report. And small in comparison to most other OECD DAC aid donor countries. 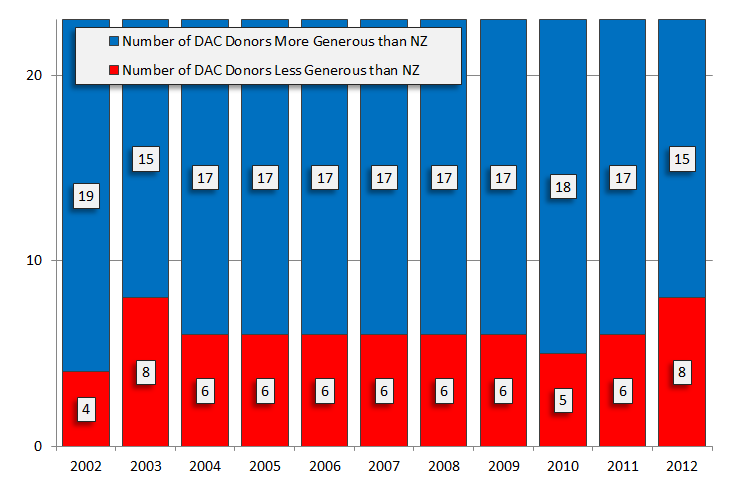 As the table below shows, with generosity measured as aid per GNI only eight DAC donors are less generous than New Zealand. For data chart details for this chart see page 9 of the report. 4. Yet although it is small, it is not trivial. New Zealand’s government ODA is considerably larger than the total donations that we Kiwis make privately every year to development NGOs. In 2011, on the basis of best available estimates (see page 12 of the report) ODA was about 3.6 times larger than total private donations. And in a small group of Pacific countries New Zealand is a major donor. 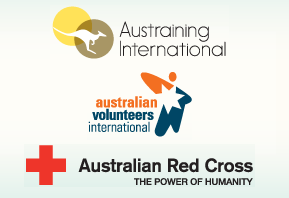 In 2011, in three Pacific countries (or territories) we were by far the largest donor, while in another seven we gave more than five per cent of the total aid that country received. 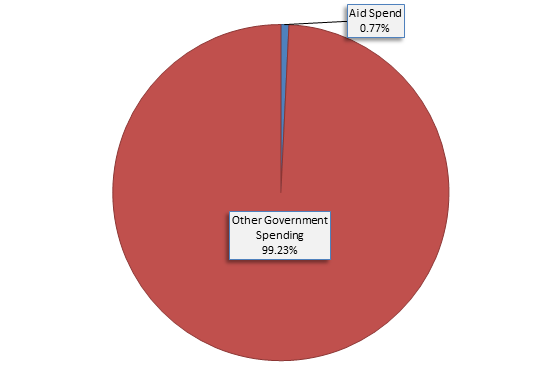 The Y axis shows NZ aid as a proportion of total aid received by that country in 2011. 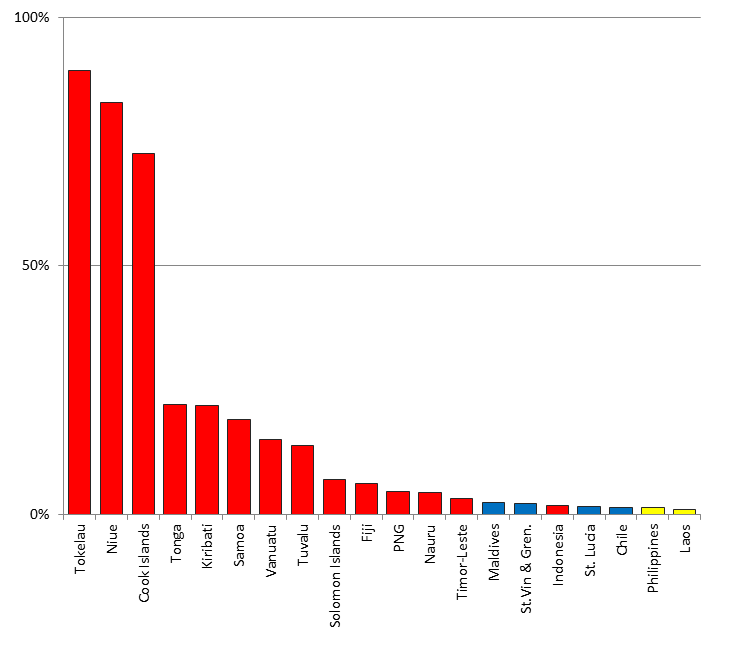 The countries listed on the X axis are the 20 where NZ aid was largest as a proportion of total aid. For chart details see page 36 of the report. 5. 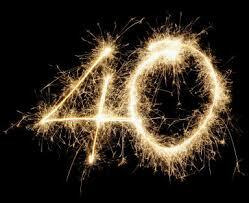 Despite the fact that it is small in total quantity, New Zealand ODA is spread over a lot of countries: 70 in 2011. 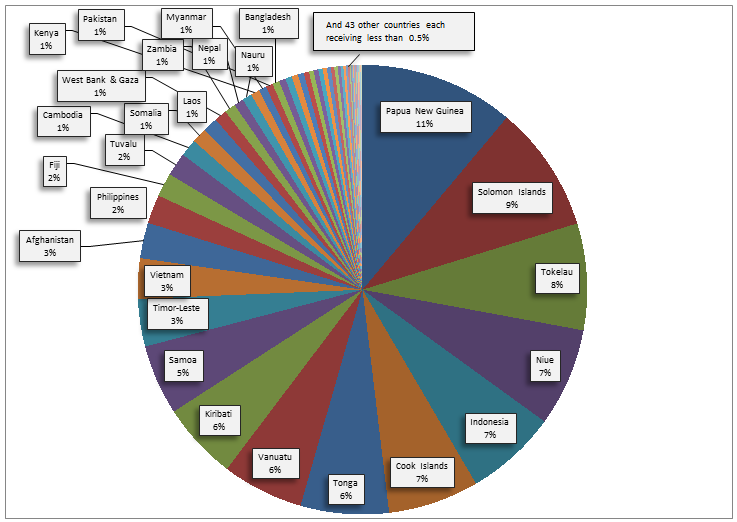 This chart is based on 2011 data and shows the proportion of country allocable aid spend that each country receives, based on 2011 data. 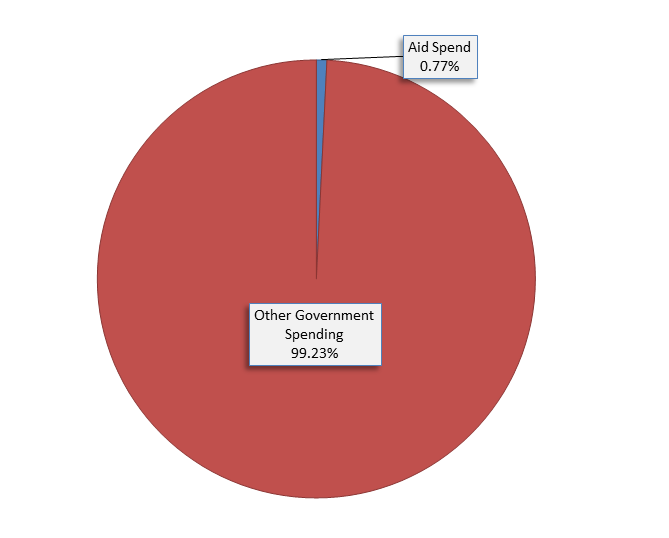 There are 43 additional countries (that are not named in the chart) each receiving less than one per cent of the aid spend. For chart details see page 30 of the report. 6. New Zealand gives most (between 60 and 70 per cent) of its aid bilaterally — that is directly to the governments of recipient countries, or to contractors or NGOs for their work in particular countries. 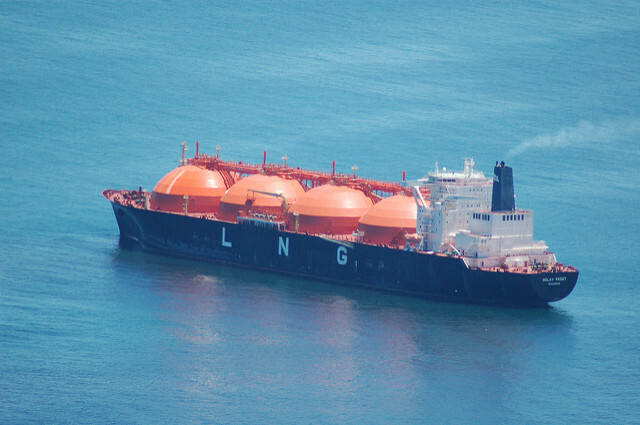 About 10 per cent of its ODA is given to multilateral organisations such as the UNDP and World Bank in a way that is tied to work in particular countries, and the remainder is given to multilateral organisations in a manner that is not tied to particular countries or activities. Chart details can be found on page 15 of the report. 7. New Zealand aid has changed, and is changing. This is, in part, a product of political changes in Wellington. The election of a Labour government in 1999 brought in its wake a semi-autonomous aid programme, modest but steady increases in ODA as a proportion of GNI, and changes in the focus of ODA. 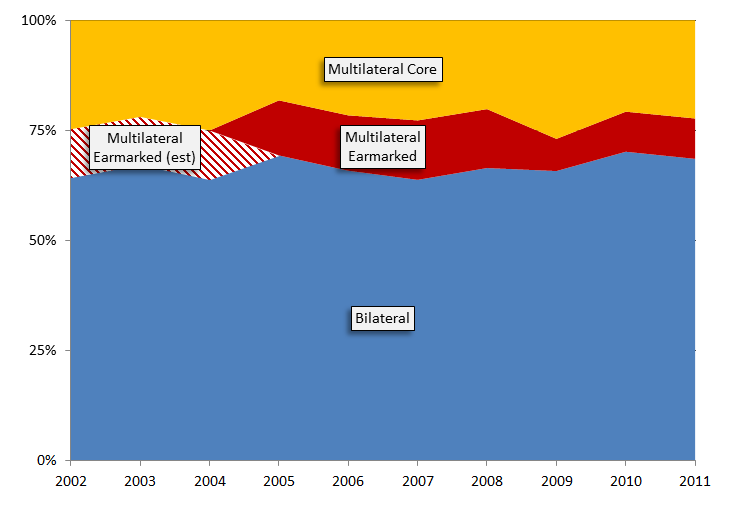 From 2002 until 2008, education remained the main sectoral focus of the aid programme (albeit far from a sole focus), but increasing amounts of education ODA were devoted to funding primary education rather than being given in the form of tertiary scholarships (see discussion on page 22 of the report). Since the change of government in 2008, the aid agency has been reintegrated into New Zealand’s Foreign Ministry and aid as a proportion of GNI has grown only erratically. Meanwhile the portion of aid allocated to sectors directly related to economic development has increased. And aid coded as being in ‘support of gender equality and women’s empowerment’ has decreased significantly (see page 30 of the report). 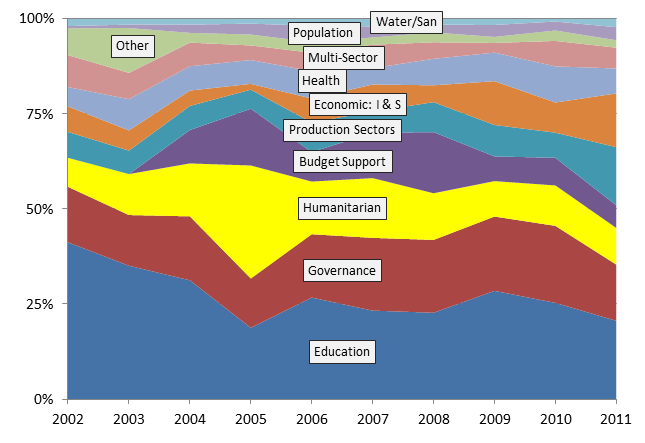 Chart showing New Zealand aid spending by sector. “Production Sectors” and “Economic: I & S” are the two sectors most directly related to economic development. Chart details can be found on page 20 of the report. 8. While quantitative data on aid allow us to say a lot about New Zealand ODA and its changing nature, they are not enough on their own to paint a complete picture. A lot of what distinguishes good aid from bad aid is much harder to quantify and very hard to glean from the data currently available, which means that to really understand the worth of a country’s aid effort other research is required. 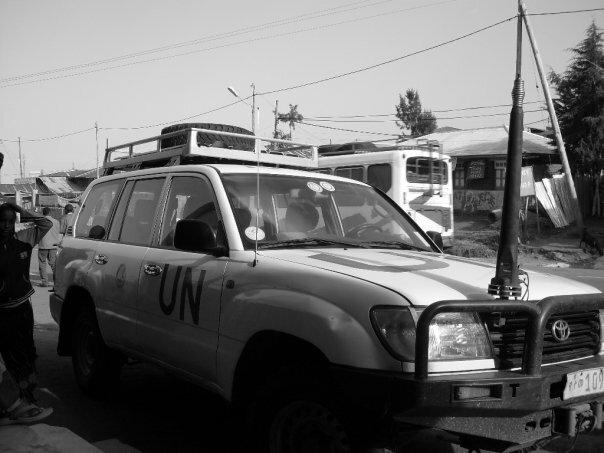 In writing this report, alongside the aid data we drew on documentary evidence to enable us to tell a fuller story. And, more broadly, ourselves and other academics have undertaken more of this kind of research through NZADDs, and we’ve reported on other important aid news here on Devpolicy (for example, this, this, this and this). While we hope to make more of the aid data in the future, we recognise that other types of analysis remain as necessary as ever. Terence Wood is a Research Officer at the Development Policy Centre and a PhD student in the State Society and Governance in Melanesia Program at ANU. Prior to commencing study he worked for the New Zealand government aid program. Joanna Spratt is a PhD candidate at the Crawford School of Public Policy. 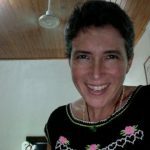 She is also a consultant and coordinator of NZ Aid and Development Dialogues (NZADDs), with a background in nursing and international development. Thanks Milos, great to hear our analysis was of use to you. An interesting read. Although quantitative data does not show the whole picture as you say, its disappointing that our development aid figure reaches nowhere near the 0.7% target (particularly when countries such as Sweden show that it can be reached if there is the political will). Nonetheless, it is interesting to learn more about New Zealand’s development aid priorities, so thanks!